When I was 24, I had a trip (psychedelic) that changed my life. My fear-filled mind opened and a trusting, connected, honest, kind, joyful being trapped inside my zipped up persona took over. Sitting for hours with a group of friends, I narrated this vision of fearless love. Why not, I asked, devote ourselves to living this way. No secrets. No power trips. No ego. Remember, it was 1969. Love, radical love was in the air. They got on board and we lived into the implications of that vision. Well, it turns out you can’t banish the ego so easily. I now know you don’t even want to, but fifty years ago everything seemed possible and immanent. My ego was like fly-paper. Try as I might, I couldn’t banish it – so I just buried my fear and tried to live up to the dream. I loved our life. The heroics, the antics, the laughter. As part of this group, all I wanted to do was make the world a better place – and I had so many ideas about how to do that and so much energy to make my ideas happen. Somewhere in the 80s I was invited to an evening workshop. We were told to draw 2 columns on a paper, one for our work and one for our personal lives. In each we were to write all our dreams and desires. For work I had a list two pages long of who and how I wanted to be of service and projects I wanted to do and global problems I wanted to solve. The other column was blank. I could not find one desire for myself. I had nothing called “personal life” in my vocabulary. Fast forward 25 years to another revelatory incident. I just had surgery for a cancerous tumor in my colon. Each night right after I came home from the hospital I had what I call revelatory dreams, those big ones that you know are telegrams from your soul. The middle dream was this: I was pitching a comedy script to a bunch of producers around a table in LA (nothing I’d ever done). They ripped it to shreds. Crushed, I slinked out but but soon had a stroke of insight, fixed the script and brought it back. The aha! was this exact phrase: the essence of comedy is human pathos. It took years – and a stint doing comedy improv – for the dream’s meaning to become clear. “Rising above” – what I tried to do in those visionary years – misses the whole point of human life. Life isn’t life without human struggles. It’s meeting those struggles with humility, honesty and a sense if humor. Of course we all have egos. Of course they get us into messes, but in comedy, people fall down and get up again. They don’t hold on to a heroic idea and die for it. They learn their lesson and have a big party. Thus began a new season of my life. I was far more interested in being real than being right. For several years I was useless, and so happy to be that. When high horses came by, I did not ride them. Painting, comedy improv, dance, singing and new friends filled my days. My intuition and instinctual natures woke up and I never wanted to put them back to sleep. Half a decade later, I had another big idea that felt right both in the gut and in the head. I didn’t know if it would be of service, but it was surely going to be a fun challenge. I blogged daily about it (a month of eating within 10-miles of my home) and eventually these pages turned into a book and another project and I was in the world again, shaking things up, but from a sense of curiosity and fun, from the pure delight of being engaged with others. My efforts didn’t have to change the world for me to feel happy, fulfilled or purposeful, yet I aimed high. Righteousness, it turned out, was like dancing or singing or comedy improv. Our heroic team of world changers had this quote by Rabindranath Tagore on the wall, “”I slept and dreamt that life was joy. 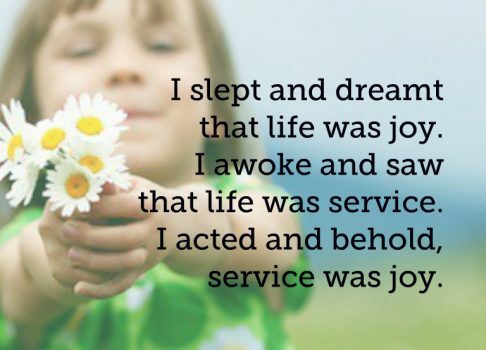 I awoke and saw that life was service. I acted and behold, service was joy.” I secretly worried that I wasn’t having the requisite joy while I served or service when I enjoyed myself. Fun and service were still two different experiences. But 25 years later, I finally got it. 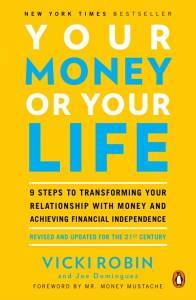 In our fragmented world, some people are fully focused on their private lives with no aspirations for anything bigger (unless it’s a house or motorhome or riding lawnmower), and some are passionately ideological, pro or anti anything and everything. Neither disengagement or moralizing from whatever pulpit (or talk show) will have you is of any use in these times. How can the service we need be the joy we crave? It’s not about finding a nebbishy middle ground, watered down, safe and ineffective. It’s about finding common ground, where we can stand together and get the work of our times done. Each of us, whatever we believe or do, owes something to the common good. Polarization rips apart the fabric of who we are. “Whatever”ism just lets the fabric fray. The “common good” is a common project. It’s a fabric woven by each of us taking whatever small or grand actions to make life better for everyone. It’s tithing 10% of your attention and time to service. Not to be good. Not because it’s fun. But that sweet spot where your insides and the outside world align and a buoyancy gets you to offer some help or pick up some trash while no one is looking. In the months ahead I will unpack this phrase in blog posts, speeches, podcasts and conversations. The Life Design part is living intentionally, letting purpose and happiness arrange your days, being the best you possible. “With the World in Mind” says that we are all in this together, whatever this is. We have public lives, not just private lives. And being of service isn’t some gesture to impress others with your virtue. Service describes that delicious interface between you and the world, that place of presence and love. That place that opened up for me 50 years ago and has been a compass since, however much I’ve stumbled along the way. 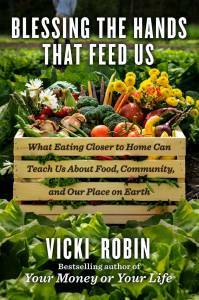 Vicki, first, thank you for starting this master class series of blog posts to share your ideas about “life design with the world in mind”. You’ve thought about this a lot and for a long time. I and I’m sure others will appreciate reading your thoughts and seeing what you inspire in us. Your words make me think that joy is the compass to follow to the lands where we can be of greatest service. I can’t think of a better guide than joy, that beautiful outward manifestation of love. I think that acting from a place of joy helps us let go of the ego that wants every act of service to have an immediate visible positive effect in the world. If we act out of joy, our real immediate reward for the effort can be that inner joy. We don’t have to measure “success” by getting a specific immediate effect or outcome. Each act of service makes something more real and more possible in the world. We cannot predict the effect that each act of ours, alone and in combination with others, will yield over time. So it makes sense to me that we strive to act out of a place of joy and love, so our actions can help tip the scales towards a better and happier world for all. I’ve been wondering how to be of service despite the loveless divisions swirling around us. Thanks for articulating a way to get beyond that stuck paradigm: “finding common ground, where we can stand together and get the work of our times done”.